Way, way back in 1984, a 17 year old Lynda Alsip worked part-time jobs and saved up $800 to buy her first car, a forest-green 1967 Ford Mustang, which was built the same year she was born. Each day, driving it to school, Alsip’s ride gleamed in the high school parking lot. Having an affinity for old muscle cars, it was her prized possession; that is… until it was stolen from the driveway of her house. 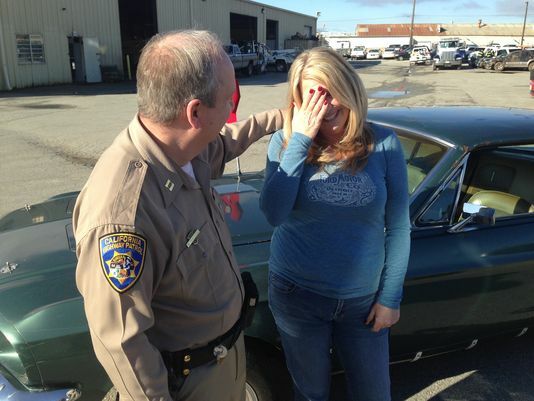 On Monday, after 28 years of separation, Lynda was reunited with her prized ’67 Ford Mustang. According to the California Highway Patrol, they located the ride just 30 miles from Lynda’s home after a man who had bought the vehicle back in 1991 attempted to register it, which raised red flags within the system. How exactly the car came into his possession is still a mystery, said officer James Rio. Linda said that when she saw the officer approaching her house, she immediately wondered if something had happened to her children. But after being asked if she had ever had a car stolen, she broke down and quickly remembered her prized green Mustang. This entry was posted in Culture and tagged california highway patrol, ford mustang, green, Lynda Alsip, mustang. Bookmark the permalink.